Harry Fuller “… will be discussing his book and tales of birding on Thursday, August 13 from 7:00 to 8:30 p.m. at the Ashland Branch Library, 410 Siskiyou Boulevard. 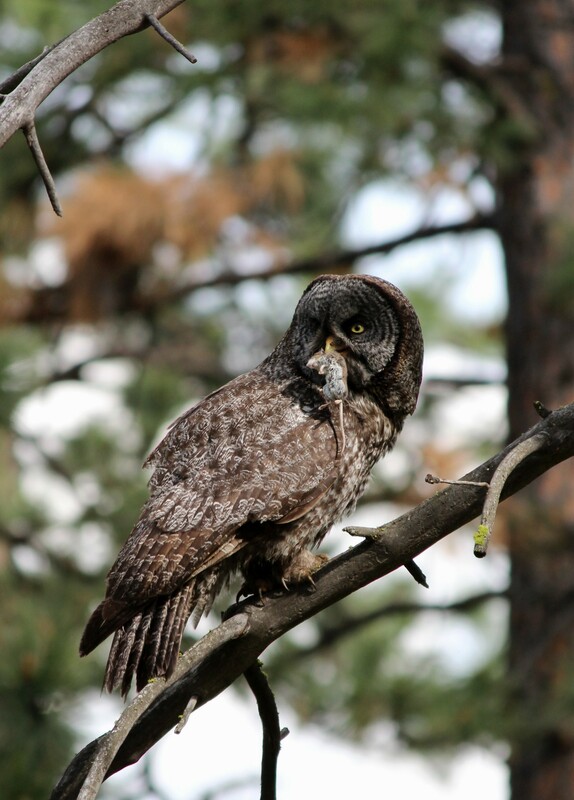 “Great Gray Owls are one of the most mysterious and sought-after bird residents of California, Oregon, and Washington. Even though it is the tallest owl in North America, and notoriously approachable by humans, the Great Gray is hard to find. Biologists surveying for other species may happen accidentally on the owl, but finding it intentionally isn’t easy due to its nocturnal habits, excellent camouflage, and silent flight. Despite high breeding concentrations in the Wallowa Mountains of Oregon, Great Grays are of conservation concern to wildlife managers in Oregon due to declines in the overall population and loss of habitat. “Fuller is author of Freeway Birding, San Francisco to Seattle, about birds found within 20 miles of interchanges. He has taught numerous classes at the Klamath Bird Observatory, Osher Lifelong Learning Institute, and North Mountain Nature Park in Ashland. The photo is this blog was taken by Andy Huber on his ranch near La Grande, Oregon. Huber has been helping a widowed female owl feed her four fledglings. He has been live-trapping small mammals and releasing them near the adult and young owls so they can re-catch their prey. They will not eat animals previously killed. You are currently browsing the ecowise blog archives for July, 2015.